Gucci Guilty Pour Homme is the hotly anticipated masculine follow-up to the decadent Gucci Guilty, a timeless and charismatic fragrance that is as stylish as a well tailored suit. The scent is a distinctive fougère that blends notes of Lemon, Lavender, Neroli and Sandalwood. 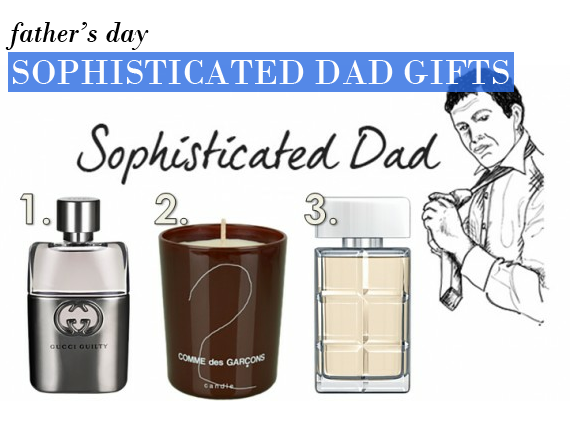 The sleek and stylish flacon is perfect for sophisticated dads, and the intoxicating scent is a sure fire winner. This sophisticated and masculine home fragrance candle is as luxurious as you’d expect from the avant-garde house of Comme Des Garcons. The glass jar is coloured in an earthy brown hue reminiscent of the Comme Des Garcons 2 fragrance, with a scent that draws its inspiration from the ancient Japanese art of calligraphy. Notes of Mandarin, Tea, Nutmeg, Ink, and Patchouli are blended to a heady degree, making for an edgy and sophisticated talking point. A warm and confident fragrance with a laidback charm, this new Boss scent creates its feel-good aura with Apple, Frankincense and Vanilla. The added note of Burbinga Wood adds an unusual and charismatic dimension to the scent, lending a creamy warmth that wears incredibly well on the skin. The chunky yet sleek bottle is stylish and bold, a perfect choice for the sophisticated dad. It was a present for my hubby. He loves it and so do I. Very masculine. Lasts for a long time. The bottle looks clasic and elegant. Highly recommend. This entry was posted on Tuesday, June 14th, 2011 at 1:00 pm and is filed under Gifts. You can follow any responses to this entry through the RSS 2.0 feed. You can skip to the end and leave a response. Pinging is currently not allowed.